Today after Holy Communion, our new trustees will take their oath. The letter from the bishop and the list of the parish council members are attached herewith. Please bring all your children for a special blessing on this feast of Holy Family. There will be only one Mass at 11 AM in Malayalam. Kindly find the attachment for the approval Document. This transmission may contain privileged and confidential information and is intended only for the use of the person (s) named above. Except for the intended recipient, or an employee or agent responsible for delivering this message to the intended recipient, any review, dissemination, distribution or duplication of this communication is strictly prohibited. If you are not the intended recipient, please contact the sender immediately by reply e-mail and destroy all copies of the original message. Please fully read and note this email. People are asking me if there is CCD today, Sun, Dec 23. Lunch will be served for all. When there is no CCD, and on holidays and feast days still we will have separate English Mass in the social hall at the same time. "we do not want to give our children the impression that it's not important to go to church if there is no CCD"
On Thanksgiving Sunday, we had common English Mass and we only had about 50% of our children present. On Dec 30, Sun, we don't have CCD; but all should attend church if you are in town because after both Masses (up and down) we will all gather at church to introduce and swear in our new trustees for 2019-2020. Please get your passes for the Family after Masses from the help desk. May the Holy Family of Jesus bless and protect all our families! Call me, WhatsApp or test at 8454909307 if you have any questions or concerns. We have adoration from 10.15am at church to intercede for the retreat. After the Pageant/Carol songs we have separate Masses in Malayalam and English. And thereafter common fellowship in the social hall. False message may have come using my name and an email ID looks like mine but has added 127 to it. Please ignore an email asking for favor using my Full name. The email they created is not mine. It's not a hacking. It's a email similar to mine, check it out closely. But the use of my name could easily mislead. I will never ask for any favor in an email; if needed I will only call. Do not give money ever you buy/order things for me. If I need I will buy. For the church; it will be sure announced from the pulpit. Tomorrow, Dec 16, Sunday after the 11.00 AM Mass, please remain in the church for a short meeting in-order for me to announce to you all an important news about our church. I ask the CCD students and teachers also to be present in the church around 11.50am after the classes and lunch. Please shorten the classes if needed. It may take approximately half hour. I will shorten my homily and try to finish up before the 12.30pm Mass. Thank you for your kind cooperation within this short notice. It is that time of the year again when friends and family gather to share the holiday season with Christmas Carol. Our Ward based Christmas Carol starts today from St Jude Ward. All Parish members are requested to contact their Ward Leaders for the latest schedule of Christmas Carol. Please see the schedule below and contact below representatives for more information. St Sebastian Ward carol will be doing their carol on Dec 15 only. Bob Chamberlain's Funeral mass - today at 11.00 AM- A short tribute from me! I ask my dear friends of Syro-Malabar to attend Bob's funeral Mass today, Saturday Dec 1, at 11.00 AM if you are free. We owe him immensely for how much we have progressed at St. Boniface in communion with the Latin Rite parish group that existed here when we arrived in 2012. Mr. Chamberlain passed away a few days ago at age 75. Bob had cancer on the lungs. He is the person whom we saw with a gray 'pony tail' hairstyle and beard. He spoke to most every one of us with a welcoming smile. He was a forensic accountant by profession. During the past year he was seen on a wheelchair. Bob is survived by his wife candy and children Bobby and Ryan. 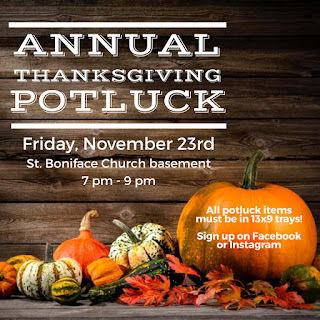 As a founding member of St. Boniface Church, Bob has been a great friend of our St. Mary's Community ever since we moved here in 2012. He helped me to pacify and make sense to many existing parishioners who could not really grasp the benefit of St. Mary's group moving to this church. He was the Chair of Finance Committee and prior to that had been the Chair of the Parish Council. He also edited the bulletins and was very eager to include all our parish details and publish all important news. Bob's constant assistance and due diligence that he applied in giving me directions regarding the administration of this bi-ritual-twin parish has been greatly helpful in all discussions with the Archdiocese of New York in relation to the sale of this church to our community. He hasn't lived to see the completion of that process; but took leadership in collecting signatures from the St. Boniface people asking the Archdiocese to sell this church building and property to ONLY the SYRO-MALABAR group. Bob passed away a week after the letter was sent to Cardinal Timothy Dolan. While in his death-bed, a day before his demise, tears of joy rolled down his cheek when I told him that the Cardinal's response to the request is positive. He considered us perfectly equal to the St. Boniface Community in status as one of the Rites of the Universal Catholic Church. He worked with all our trustees since 2012 and remained throughout as a bridge between both groups in regards to the planning of common functions, solving issues and protecting our rights as people who worship under the same roof. At the same time he acted wisely by being neutral and impartial creating great impression and contentment among the St. Boniface group as well. Bob was a peacemaker and a believer in fairly promoting the pursuit of the American dream for all God's children. I will miss this trustworthy friend and counselor during all my remaining times on earth. It's an immense personal loss for me. If any one of us is free today to show up and thank Candy and children for what was to us and pray for his soul, you have done your duty. May Bob Chamberlain rest in peace and let perpetual light shine upon him. Here is an opportunity for those who are interested in the Syro Malabar Convention that takes place in Houston, Texas in August 2019 to do a survey to express your expectations from such a gathering. Convention Houston 2019 planning committee. Convention tailored to the needs of our communities. Parish Council members, CCE teachers, religious organizations, etc. making this Convention a grand success. Where: Items will be donated to Covenant House, a Catholic nonprofit organization helping homeless youth. 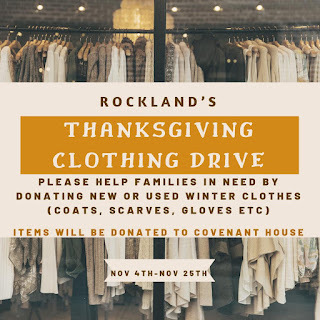 What: Any new or gently used clothing item like coats, scarves, gloves, sweaters etc are accepted. There is a donation box next to the Help Desk. Your donations are much appreciated! 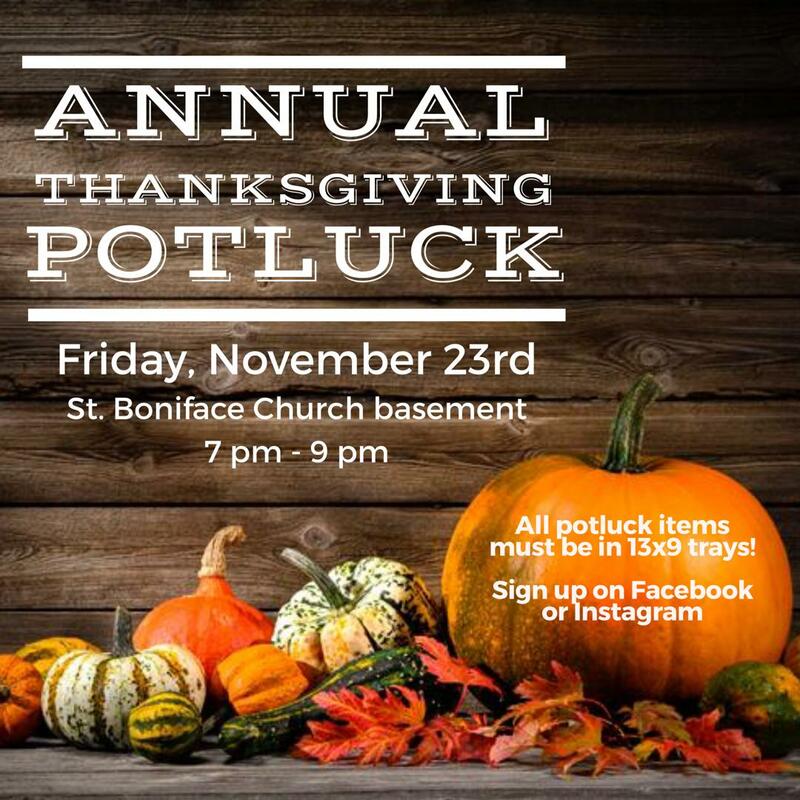 The Youth Team would like to invite you to our Annual Thanksgiving Potluck this Friday November 23rd! Who: Ages 13-35 are welcome! Please encourage your children to come it is a good way for them to get to know the youth group. The last day for sign up is Sunday, December 16, 2018. All music should be submitted by Sunday, December 23, 2018. Welcoming all of you to this annual parish family celebration of friendship, food and fun. This event will be held at Fieldstone Middle School, 100 Fieldstone Drive Thiells, NY 10984. Please find the time to attend this retreat at our church to prepare for Christmas. Due to weather conditions and that the snow removal from near the church doors are delayed, I regret that our 5.30 evening Mass is cancelled. We will have Mass tomorrow morning at 9am. What: Any new or used clothing item like coats, scarves, gloves, sweaters etc are accepted. There is a donation box next to the Help Desk. 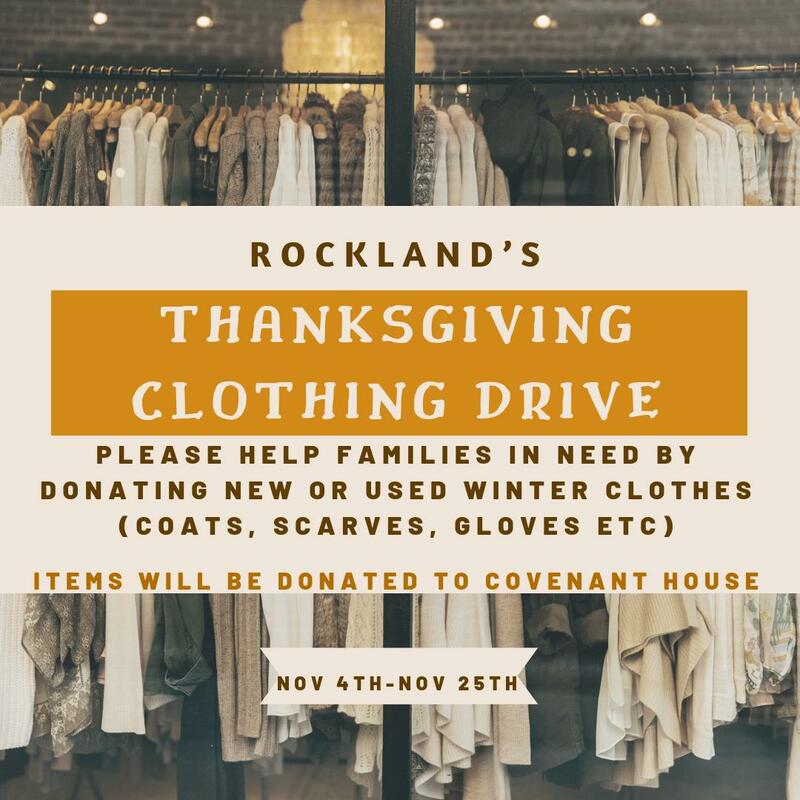 Your donations are much appreciated and let's help youth in need this Thanksgiving! Please bring a food item in a 13 x 9 tray. You can sign up here. Thank you! Fr Regi (Mathew) Pazhoor who serves at Buchanan church is returning to India by the end of this month to take up position as the Principle of Marian College, Kuttikanam (MBA section). He is from Kanjirappally diocese. Fr Regi has helped us on several occasions to cover for Holy Masses and has been a great friend and supporter of our community. Today is the only Sunday available for him to be with us. Therefore Fr Regi will offer the 11am Malayalam Mass. Please bid farewell to him and offer your prayers. 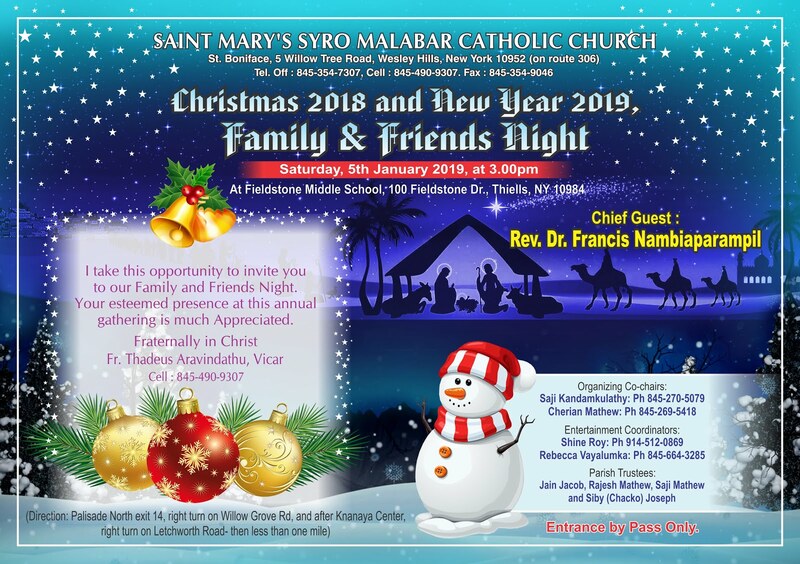 As I informed you in a previous mail, we are expecting Bp Alappat to address us after the 11am Mass about the Syro Malabar Convention- 2019 and thereafter Fr Francis Nambiaparambil will offer the 12.30pm English SM Mass. 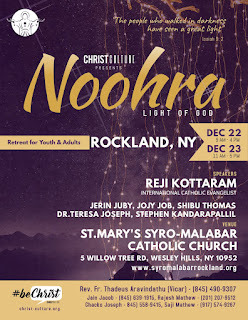 This Sunday, Nov 4, Bishop Joy Alappatt will be visiting us to make a small presentation about the Syo-Malabar Diocese's National Convention that happens in Aug 2019 in Huston, TX. I will be offering the 11.00 AM Malayalam Mass, skip the homily and the Bishop will use that time at the end of the Mass to address us. The CCD classes will come up to the church at that time to join us. Thereafter we will have the usual English Mass at 12.30 pm. Bishop Joy is visiting the Bronx church in the morning and after ours, he will go to Buchanan church for the same purpose. This information is shared with you this 'last minute', because I came to know about this visit only a couple of days ago. Please take a look at the website given below. You may register online for a reduced rate until Dec 31 and also up to April 2019. Or you may print out the reg. form and bring it on Sunday to present to the Bishop in person publicly. 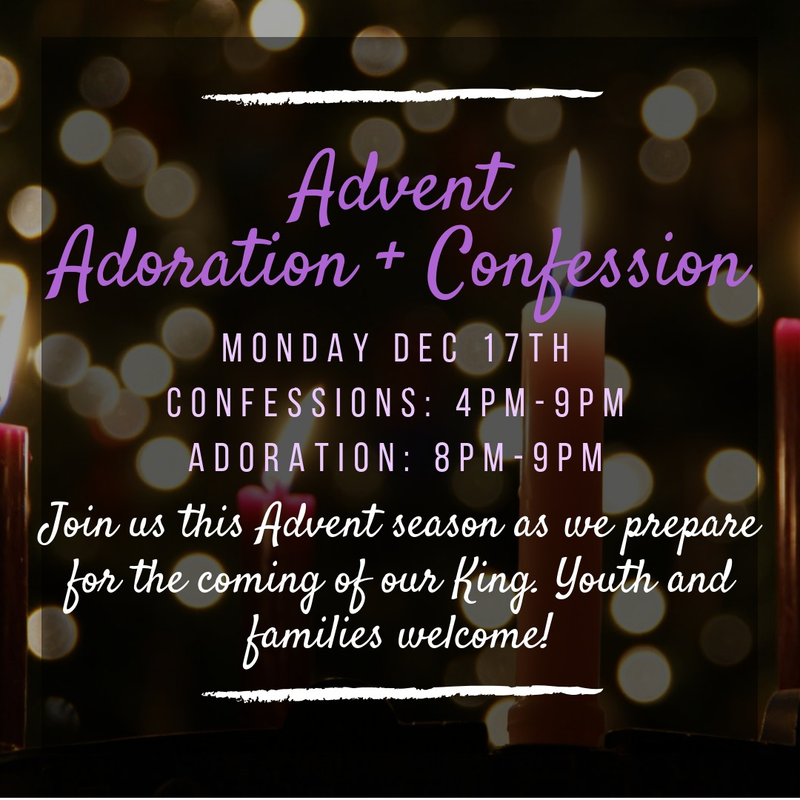 Adoration will be from 5.30pm to 6.30pm before Mass. After Holy Mass and 'Oppeese' we will have Benediction or 'Vazhvu' and Consecration of our Families to the Sacred Heart of Jesus. > Friday, tomorrow, 6.30pm followed by Remembrance prayer for the dead. > Those who would like to bring a candle to offer at the altar at the beginning or end of the Mass in remembrance of their loved ones who passed away since last November are welcome to do so. > May all souls of the faithful departed through the mercy of God Rest In Peace! Friday, tomorrow, 6.30pm followed by Remembrance prayer for the dead. Those who would like to bring a candle to offer at the altar at the beginning or end of the Mass in remembrance of their loved ones who passed away since last November are welcome to do so. May all souls of the faithful departed through the mercy of God Rest In Peace! With deep sympathy, I share the sad news of the death of Smt. Annamma Philip Paingottu, (mother of Rani Jacob). Annamma passed way at age 82 in Manimala, Kottayam dist. On Oct 21. Rani, Jacob, Annmarie and Tony are on their way to India. St. Mary's parish offers our hearty condolences to Rani's dad Mr. Philip and the rest of the family and promise continued prayers for the repose of the dear departed. Tomorrow, During the Malayalam and English CCD Mass, we will have the collection for Mission Sunday. Your generosity is greatly appreciated. Our Teens Group is planning to attend the NY Youth Gathering on Oct 20 in Westchester. Seats are limited in number. I encourage you to make use of this opportunity. Use the parish name St. Boniface and St. Mary's, Wesley Hills. You may directly register for this program using the link from the message from Cardinal Dolan. Kids are advertising through social media; but I doubt how many teens have access to the Instagram and facebook. One of the most courageous people in the Bible was our Blessed Mother. An angel appeared to her when she was a teenager and asked her to bear a child, the Savior of the world. It's unimaginable! But even more astounding was that she had the courage to boldly say "Yes!" to God. 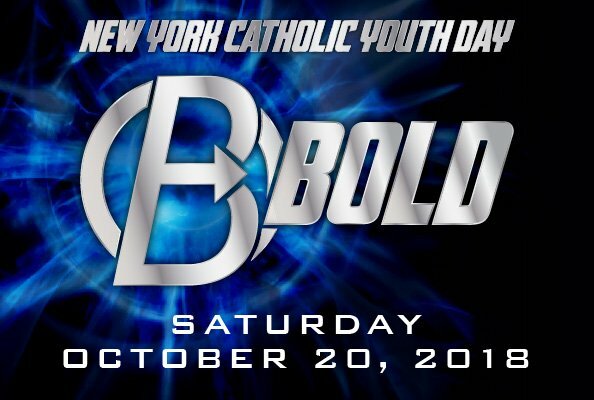 On October 20, our own beloved teenagers from the Archdiocese of New York are invited to Be Bold and embrace what God has in store for them at the 6th annual New York Catholic Youth Day. As the angel Gabriel said to Mary, "Do not be afraid, Mary, for you have found favor with God," in turn we tell our young people to trust that God has a plan for their lives. 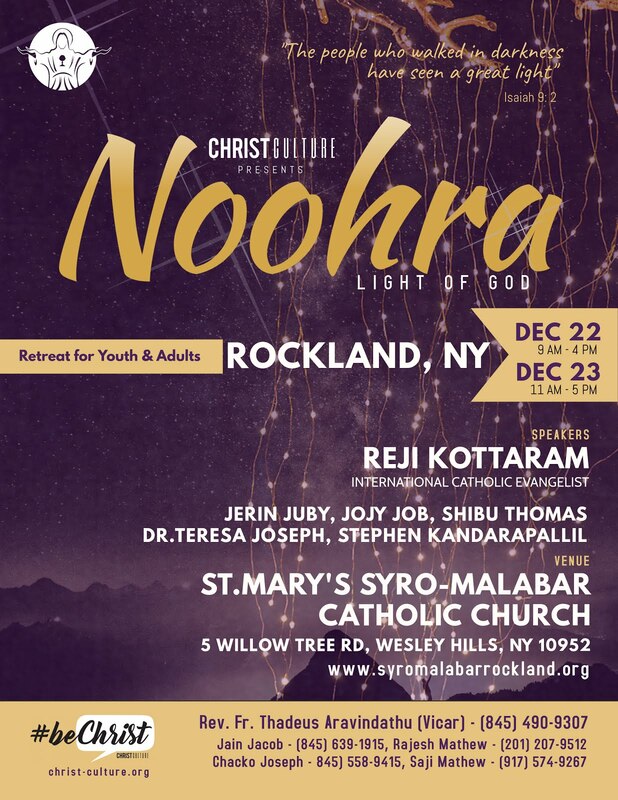 Our Office of Youth Ministry has planned a day at the Westchester County Center that invites youth to connect to the Lord and to one another through engaging talks, lively music, service projects, and the sacraments. I would like to invite you to think of the high school aged young people in your life—children, grandchildren, nieces and nephews, neighbors, students—who would benefit from a day like this. I would like to meet them on October 20! Details and registration information for youth leaders can be found here at oymny.org/nycyd. If you have any questions, please contact the Office of Youth Ministry at youthministry@archny.org or 914-367-8329. Be Bold and encourage the young people in your life to attend New York Catholic Youth Day! Replies to this email can only be seen by admins. Click the Reply button above to leave a public reply. Conquer - Jesus Youth boy's gathering will take place at The College Settlement of Philadelphia day camp, 593 Witmer Road, Horsham, PA 19044 from Oct 19th, 7 PM till Oct 21st 3 PM. Gather with other high school aged men for a weekend of joyful fellowship, dynamic talks, small group discussions, enriching prayer experiences and fulfilled sports and activities. 9th grades to college freshman are invited and encouraged to attend and spend the weekend with Jesus Youth Young adults. Cost $50 to $100 (Sliding scale, pay what you are able) . Please make check payable to "Jesus Youth". Please contact Rebecca Vayalumkal, if you have any questions. Kindly note, a second collection will be taken today during the Malayalam Mass to support St Vincent De Paul Society. 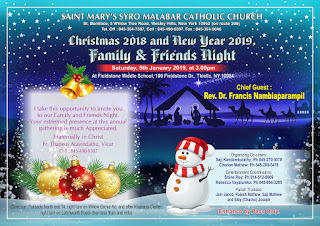 Please write checks in favor of '" St Mary's Syro Malabar Catholic Church " and use the provided church envelopes . 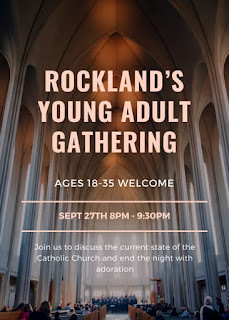 We will have a Young Adult gathering on Thursday September 27 from 8 to 9:30 PM in the Parish Hall. 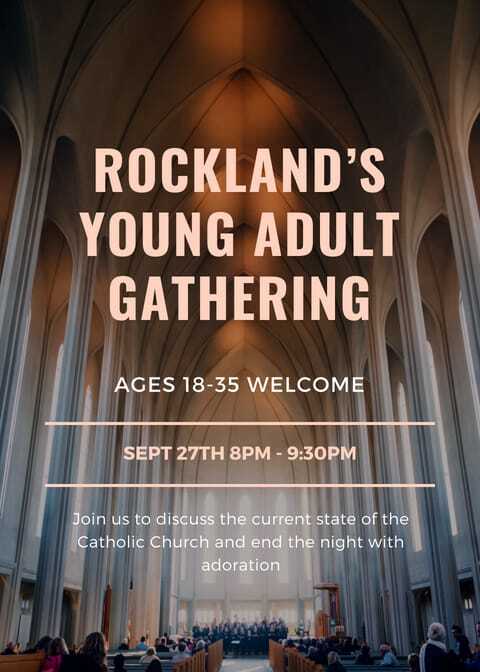 All Young Adults (18 to 35 years old) are invited to join together to discuss the current events in the Catholic Church, how to remain hopeful, and end the night in Adoration with our Lord! 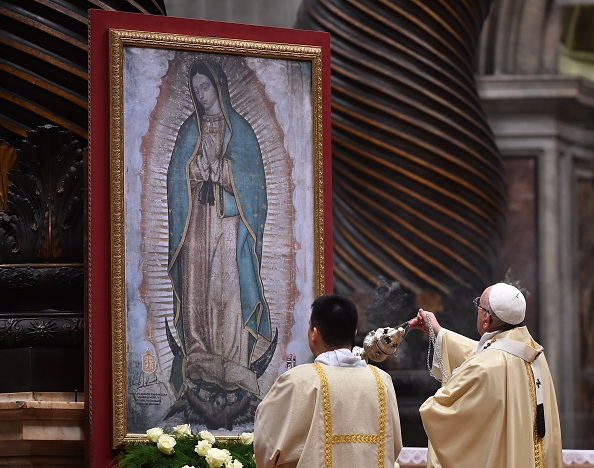 Here is an opportunity to visit Guadalupe. Fr Francis Nambiaparambil is leading. See details below and in the attachment. Here is an opportunity to have a memorable spiritual experience to celebrate THREE FEASTS - Immaculate Conception (Dec. 8), St. Juan Diego to whom the Blessed Mother appeared in 1531 (Dec. 9) & Our Lady of Guadalupe (Dec. 12 ) - and a relaxing vacationing joining the colorful Mexican Celebrations!!!!!! 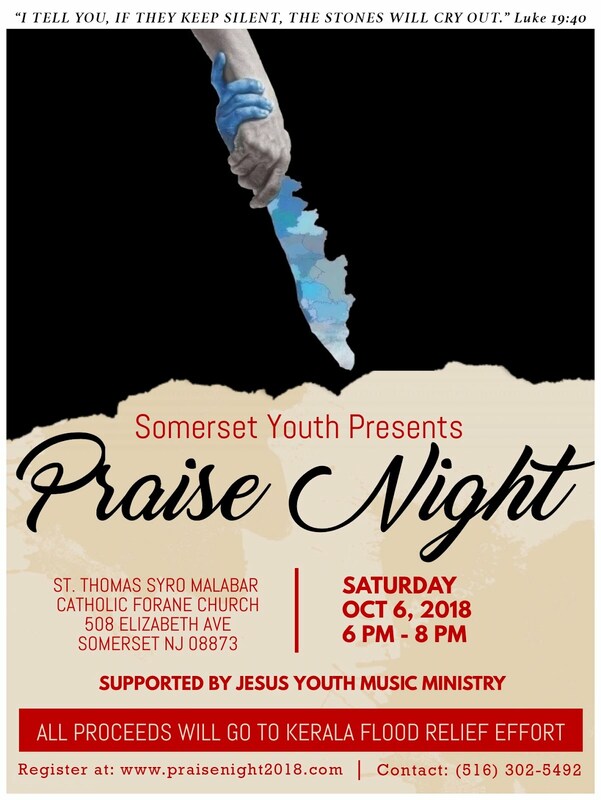 The Somerset Youth and Young Adults would like to host us all at Praise Night 2018 at their church in Somerset, NJ on October 6th from 6 pm to 8 pm. The purpose of the night is to pray for the families affected by the Kerala floods and to raise funds via donations and t-shirt sales on the website (praisenight2018.com). You can expect modern worship music, a powerful skit, speeches, and adoration. Praise Night is open to EVERYONE not just youth! You can register online for free at praisenight2018.com. Please see the attached flyer for more details, or contact Treasa Roy or Drexell Valiplackal (both cc'd). Mary Matha Malayalam School is entering into its 7th year of service. Classes will begin on this Friday (09/21/18) at 7.30 PM. Those who haven't registered for this school year may use the attached registration form for admission. Please bring the children to the Church Social hall few minutes early. And pick them up from class rooms upon release. If you have any question, Please reach Malayalam School Director Nirmala Joseph at 347-204-0062. PS: Admission is open to the public (members and non-members). Please ignore the fake emails that come with my name, if you get any now or in the future. Please know that I will NEVER ask for anything personal through email. I will only call you. We are excited to have a Youth Meeting this week to kick-off the new school year. 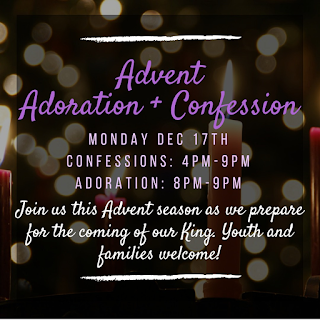 The evening will include: food, discussion, and conclude in adoration. We will also be electing new Youth leaders. We look forward to your child's participation! We are inviting all to attend the Feast of St Mary during this weekend and see below for the schedule. We have 88 sponsors this year and on behalf of our parish we would like to thanks all for the Sponsorship. May God Bless through the prayers of our Mother Mary!. Sign Up for the St Mary's Feast 2019 ---Started and Open now….. The sign up for the sponsorship of St Mary's Feast for the year 2019 already started and all are requested to be the part of our main feast for next year. The Feast Sponsorship cost will be $200 per sponsor. The blessing of the sponsors for 2019 will be done after the 4PM Feast High mass on Sunday. Non-Parishioners also can be Sponsor. Please contact any Trustees(Chacko Joseph, Jain Jacob, Rajesh Mathew & Saji Mathew) for more information.